A company based out of Philadelphia shook up UNLV’s studio theater on Feb. 25 and 26 with classic modern dance that was spiked with contemporary twists. Jeanne Ruddy, a former member of Martha Graham’s company, choreographed a piece, with additional works by Zvi Gotheiner, Jane Comfort and Peter Sparling and Janet Lilly comprising the first half of the concert. 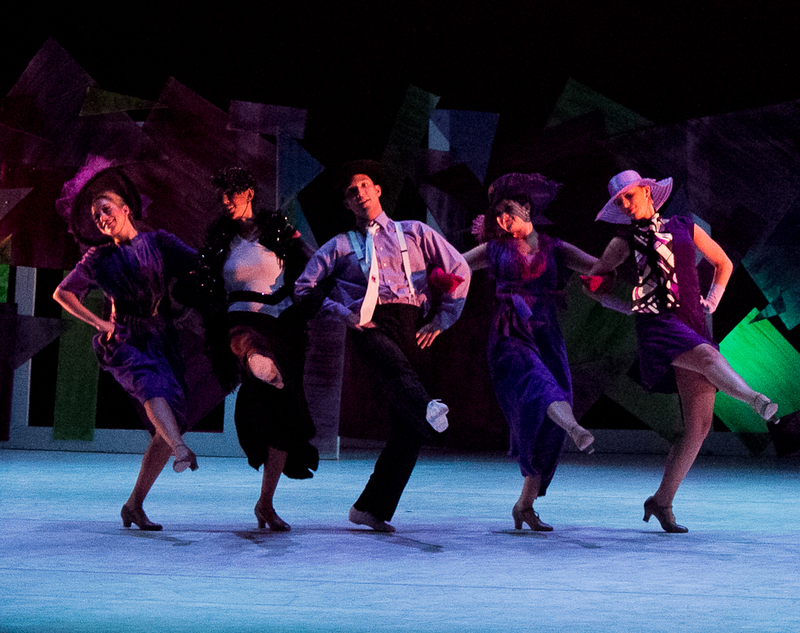 A preview of the UNLV-generated “Dancescapes” took over the second act. Janet Philla in "Significant Soil"
For being separate entities, the two sections were remarkably well-matched. The show began with “Significant Soil,” a solo choreographed by Ruddy and danced by Janet Philla or Christine Taylor, depending on the concert. The piece played on novelty a bit with a man-sized coil dangling from the ceiling and stretched the length of the stage, but the prop was tastefully incorporated. The movement was breath-centered and emotional, depicting inner torment well and reminding the audience why, exactly, modern dance can be so enjoyable to watch. 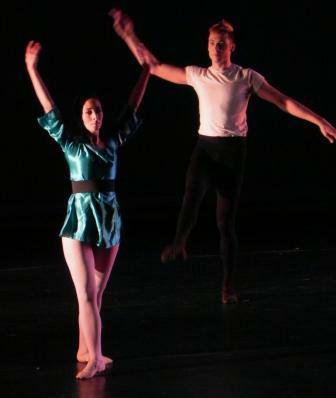 “Enflold,” by Gotheiner and danced by Rick Callender and Melissa Chisena, also utilized set pieces well. The colloquial number was performed on a bench and, considering the constraints of remaining largely stationary, the choreography was inventive and elaborate. Literal themes were taken a step further with “The System,” a work about relationships that was equally tumultuous and contemplative. 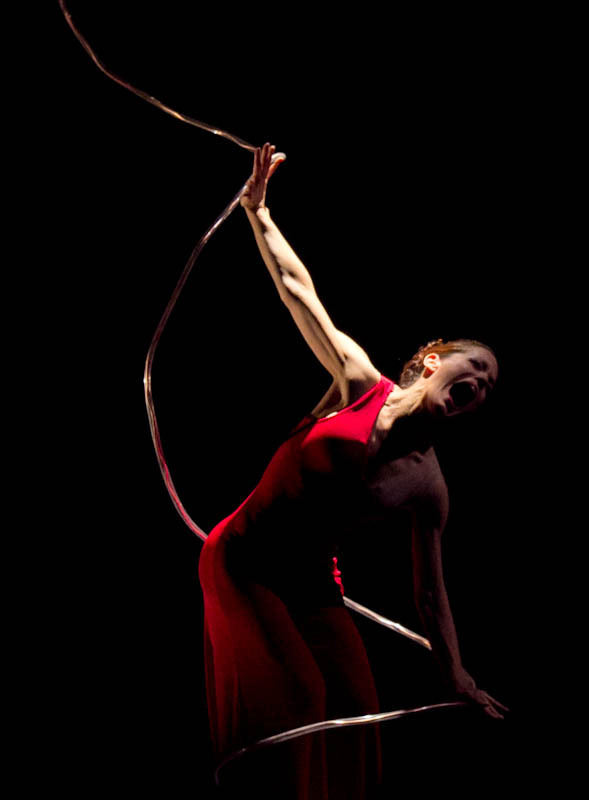 Choreographers Sparling and Lilly have created a unique and balanced piece that explored abstract movement without losing the attention of the audience. Dancers Callender and Janet Philla exemplified this with vibrant personalities and committed character-work. Melissa Chisena, Janet Philla and Meredith Riley-Stewart in "No Fear of Flying"
The second act, a mini-concert in itself, was more sympathetic to jazz than to modern but was tonally similarly to the first. Mark Dendy’s “No Fear of Flying,” performed by Chisena, Philla and Riley-Stewart, was a montage of strong female characterizations underscored by thought-provoking themes and a playful mood. 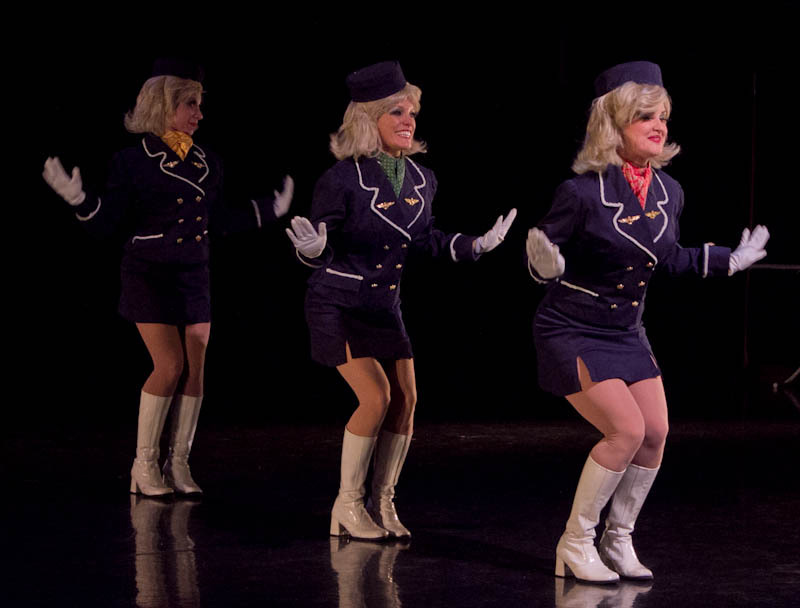 A flight-attendent-style briefing for the audience, complete with blue-suited dancers with plastic smiles, was a high point of the piece and could have been a number in itself. “At First Sight,” by Louis Kavouras, was fun and frolicsome and dancers Rachael Hayner and Alex Lum exploited this to the utmost. The two characters met, fell in love and enjoyed a fleeting few minutes of dewey-eyed romance before Hayner, quirky and exuding effortlessness, pilfered Lum’s backpack and traipsed away. Lum was adorable in his crestfallenness, completing the piece perfectly. “The V Files Medley” by Vikki Baltimore-Dale and “Prelude, Fugue, Postlude” by Dolly Kelepecz were the two most traditional pieces and added a note of solidity to the show. Baltimore-Dale did well by her dancers with edgy undulations and featured solos, although unison choreography could have been stronger. Amanda Bakalas, Anna Fazio, Jesus Nanci, Lum and Hayner each approached the choreography differently and this, accompanied by Baltimore-Dale’s signature Afro vibe, made the number dynamic and exciting. 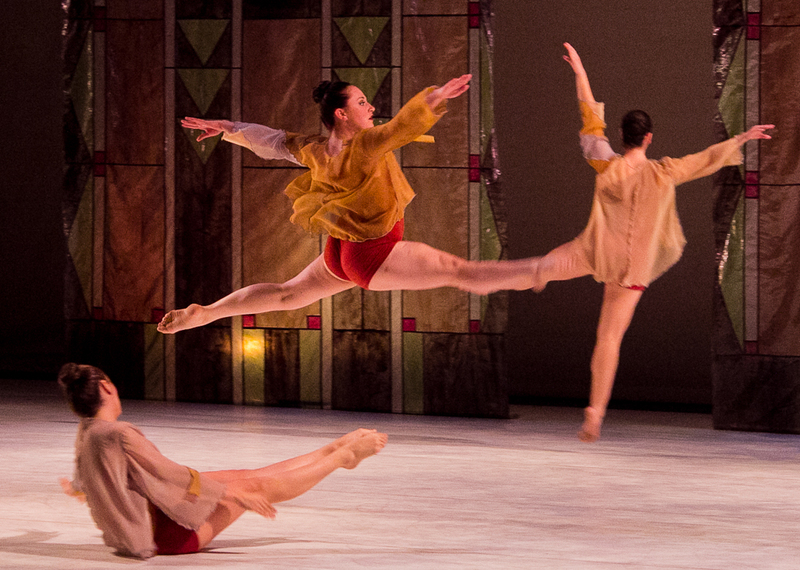 Rachael Hayner, Alex Lum and Jesus Nanci in "Prelude, Fugue, Postlude"
Kelepecz’s piece began with nontraditional lifts and choreography that was clean, straightforward and well-paired with the music. A fission-fusion method of staging was engaging to follow and avoided the static “principal and corps de ballet” configuration. The five dancers from Baltimore-Dale’s piece performed Kelepecz’s as well — the red-blooded jazz made for an interesting undercurrent and Kelepecz used this energy artfully. The University of Nevada, Las Vegas (UNLV) Department of Dance recently joined forces with dancers from the Korea National Sport University (KNSU), located in South Korea, for a production called “Together 3.” Together (get the pun? ), they performed the third installment of their co-choreographed concert series at the Judy Bayley Theatre on Oct. 1 and 2. Interestingly, collaboration seemed to be in short supply. Only one piece was actually comprised of dancers from both institutions and the two acts themselves were largely divided: only one piece in the first act was created by someone other than a UNLV faculty member. 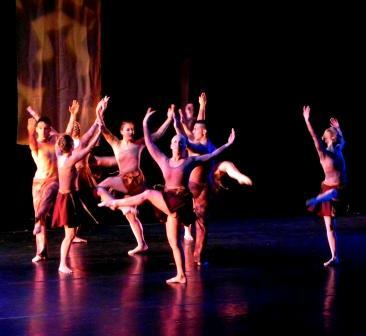 The second act was created entirely by KNSU choreographers. One of the things that stood out the most was the lighting design. The production management program, run by Peter Jakubowski, is unique in that it allows students to study production elements (like lighting and sound) intensively. The student aspect resulted in much experimentation, most of which was positive. In this, the lighting design did exactly what it was supposed to: quietly exemplify the art onstage. As far as dance elements go, the two acts were very different. For UNLV, nondenominational modern was the mainstay. This was contrasted with KNSU’s sparkling ballet that battemented off the second act, followed by their own version of contemporary jazz and modern. Granted, UNLV started the concert off strongly with “Glyph,” a jazz piece that had a sassy modern vibe, choreographed by Richard Havey. The staging and unison sections were excellent, indicating long and arduous rehearsals. The length of the piece was also appropriate and put the audience in mind of old-school concert dance, lending an auspicious start to the show. Margot Mink Colbert’s “After the Waltz” was a dissonant, disconcerting piece that elicited a “hmm …” and a head-tip. The intent could have been made more clear, but the musicality on the part of the dancers was undeniable. The bright turquoise costumes were striking and added a strong visual element to a mildly cacophonous piece. “No Where to Call Home” and “Sojourner,” choreographed by Cathy Allen and Vikki Baltimore-Dale, respectively, epitomized college dance in some questionable ways. “No Where” was strong visually but was still reminiscent of a movie with underdeveloped characters: at the end of it, the audience isn’t quite sure it cares. “Sojourner” had many of the elements of a strong number and did especially well for the male dancers. The music, as Dale’s often is, was viscerally exciting and withdrew a respectable response from the audience. However, its length went unjustified by the slightly less-than-hard-hitting energy behind the movement. Louis Kavouras and James Jeon (the lone Korean creator in the first act) both stood out as strong choreographers. Kavouras’ “At First Sight” was an exuberant study of two rag-tag characters and a bench. The exaggerated interactions provided unexpected comedy and a lighthearted reprieve and the chemistry between dancers was evident. Jeon’s “Moves” had a persistent urgency about it but began and ended in stillness, creating an interesting juxtaposition. Staging patterns were slightly muddy, but the floor-work and landings were, especially on the parts of the KNSU dancers, silent and precise. Overall, it continued along the contemplative, ethereal line of the rest of the first act. “Mozart,” also choreographed by Jeon, opened the second act with pattering bourrées, smart temp de quise, pert echappes, delicate port de bras and pointework that seemed to pluck the music’s violin strings. The costumes were spectacular and the small corps was endearing in its earnestness. There were still small indicators of student-dom, but they were few and forgivable. The strong ballet was refreshing nonetheless. “Paradise,” choreographed by Kim Hyun Nam, was a bright-eyed piece featuring strong character work, an exploration theme and bare feet. The strength of the dancers was evident and much of the animated choreography was simply adorable. The last two pieces, “Impressions of Korea” and “Feel the Sweet Story,” featured sweeping dynamics and choreography from Baek Hyun Soon, James Jeon and Lee Ye Soon. The last piece segued into the finale and a hand-shaking affair between both schools. The partnership between UNLV and KNSU has existed for a number of years and provides an international network for students in both departments. KNSU attendees come to the U.S. for a week, rehearse with UNLV dancers and take class, then perform in the concert in Vegas. Now, UNLV dance students are hopping on a plane to South Korea, where they will go through the same thing in Seoul, the national capital. There were a few small blips in the mechanics of the concert. Pauses in between numbers are understandable in some cases, but bringing the house lights up seems unnecessary. The overall length could have been shorter, although the pacing was fairly smooth. Overall, the concert was certainly respectable. Keep an eye out for the gems: they’re in there.